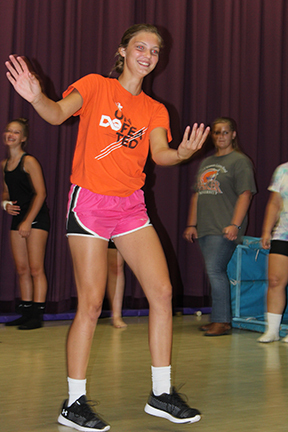 GETTING A KICK OUT OF OKLAHOMA..
"Cowboys,Farmers, and pretty gals practice new choreography for the musical "Oklahoma." 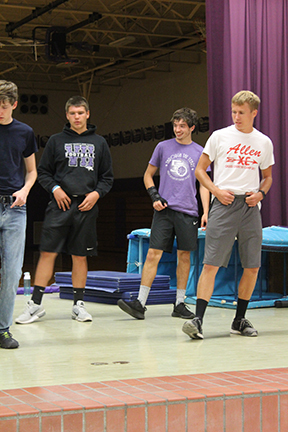 Pat Breeding, Valley Heights alumni, is at work once again teaching the dances to the cast. On Monday, September 4th the girls from the cast learned some of the steps to the number "Many a New Day," and on Tuesday the boys learned the steps to "Kansas City,"
Hours of work before the actual production are logged in at the piano and on the stage. Choreography is an important part of that preparation, and start as early as August for a November 10th, 11th and 12th production.